Earlier today (March 27) 13 defendants went into the west Roxbury District courthouse to answer charges related to their arrests protesting the West Roxbury (Mass) Lateral Pipeline. We expected to have charges against them reduced to civil infractions — the equivalent of a parking ticket. While finding no grounds to deny that motion from the prosecution, the judge chose to let each defendant testify on the necessity of their actions. 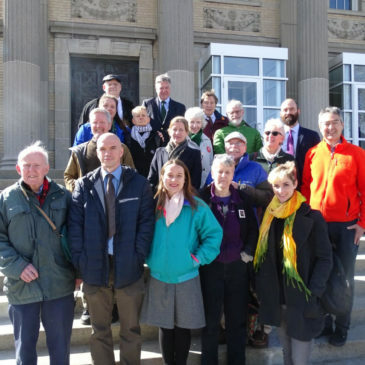 The defendants collectively presented a powerful and comprehensive argument for why they had a necessity to engage in civil disobedience to stop the imminent local and global harms of this fracked gas pipeline. Following their testimony, the judge acquitted ALL the defendants by reason of necessity. While defendants were still denied a jury trial and the possibility of a full necessity defense, this was the first time (that we know of to date) that defendants were acquitted based on climate necessity. Since then the defendants have had a celebratory lunch together, and met to talk about next steps and future struggles. Join us tomorrow at 7pm for a live online discussion! Invite your friends and family to join us and learn more. You can also read more about this campaign, the defendants and the necessity defense at the Climate Disobedience site here – they’re awesome.